Studies have proven what we all intuitively know to be true: laughter brings people together and makes them feel great. And no one delivers laughs to corporate audiences as consistently and cleverly as Scott Bloom. Whether you need a professional emcee, a world-class awards host, or an out-of-the-box guest speaker, Scott provides an insightful, interactive, laughter-packed experience that energizes your audience and transforms your event. Scott is a veteran comedian and television personality who has built a reputation as the “go-to” choice for business humor, having hosted hundreds of events for companies such as FedEx, Ford, IBM, MetLife, Pfizer and Verizon. Scott makes it his business to immerse himself in the specifics of your business and your event. That’s how he’s able to talk like an insider about your organization’s products and people, buzzwords and acronyms. In addition to his work as a highly respected emcee and comedic keynote speaker, he has had a successful career in television. Scott has been featured on Comedy Central numerous times, and was the host of his own weekly VH1 series. He currently lives in Los Angeles. A professional emcee who has hosted hundreds of corporate events, Scott can custom tailor his unique brand of showmanship to meet your needs. Whether opening the general session - introducing executives - staging audience participation segments - moderating leadership discussions – or delivering segues that underscore the objectives of the session, Scott delivers meetings with poise, power and panache. As emcee, Scott’s the master performer and the common denominator who can cultivate an engaging environment in which everyone is transfixed on the message and meeting purpose. He’s the magical glue that holds a meeting together giving it continuity and consistency. Pair that with his sharp sense of humor and ability to improv and he can take moments of important material and make them seriously funny and always memorable. 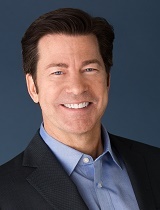 With over two decades of television and corporate hosting experience Scott’s got the credentials, the charisma and the comedy that make meeting messages resonate with audiences. With Scott, you get more than an inspiring keynote; you get customized content that is for and about your audience. It’s time to take your event, and more importantly your business, to the next level by injecting Scott’s fresh perspective. The ideas shared will surely impact your results as your team learns to build new bonds and keep your customers coming back for more. As Master of Ceremonies, Scott’s the quintessential, silver-tongued host who can lift the significance of the honor and broaden a winner’s smile! He’s a master of the mic with all the right stuff— moments of improv brilliance, creativity and charm. He can make winner’s feel extraordinarily special. And, equally important, he can make long, oft time tedious ceremonies into uplifting experiences of celebration and fun that spill out and over the winners. And the audience responds accordingly. What do John Travolta, Andre Agassi and Apple co-founder, Steve Wozniak have in common? All three of these celebrity keynotes sat down with Scott at a live event to share their personal accomplishments, career highlights and life strategies. Scott is brilliant at drawing them out while drawing your audience in. He’s got a knack for lightly extracting pertinent moments and messaging from both A-list celebrities and C-level executives. So the next time you’re looking for the perfect moderator to interview a celebrity keynote or an executive panel, choose Scott Bloom. He pulls from decades of successfully hosting meetings and moderating business discussions to produce outstanding results.